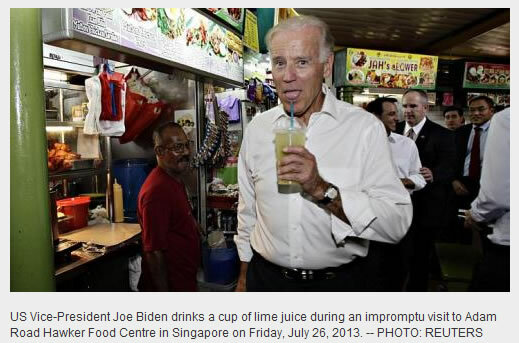 US Vice-President Joe Biden decides to visit a hawker centre on a whim during his visit here last friday & bought lime juice. How come don't he visit food court? How come don't buy Coca Cola or Pepsi? The answers explain why the hybrid regime is short sighted & chasing short-term profits. The stoppage of hawker centres building for 26 years in new residential areas brought hardship to the peasants. The Sengkang Kopitiam aka hawker centre which is operated by a bullying corporation has shoved a shitload of hardship on Sengkang residents with high price of food to cover the killer stall rentals. Yet the Youth Olympics Games Overbudget Minister still got the cheek to say he preferred hawker centres to be run on a not-for profit basis, instead of commercial operators. In the schooling days, i have a classmate moving house to Bukit Panjang. There is no hawker cemtre in that new residential area & i wondered why. Till this day, there is still no hawker centre in Bukit Panjang. Ditto likewise in new residential areas like Woodlands New Town, Jurong West etc. Why no hawker centres? Is only later in life that i realise that the current ruling party are a greedy bunch. Don't Build Hawker Centre = Millions of Profits selling land for Condominiums. US Vice President visiting a hawker centre demonstrates that hawker centres are a local attraction. Tourists want to experience the local culture & food cooked by 'motivated' local small business owners. Do tourists care about spam businesses like MacDonalds, Subway, Food Courts staffed with 'zombies workers'? Yet it is these spam businesses growing like weeds over the years. Being overly commercialised coupled with spam like crazy chain outlets do little to attract tourists who crave unique local flavor/delights at an attractive price.